Years since detection. Infected species. The number of infected US states and Canadian provinces. The ever-increasing body count. The unsustainably high mortality rates (Frick et al. 2010). In some ways, the statistics are sterilizing, objective, and easier to deal with than the stark reality of empty caves, absent roosts, and the silent spring and summer nights. But the numbers are just cold abstractions for one of the most devastating wildlife plagues to have ever swept through North America: white-nose syndrome. This pervasive disease, which affects the continent’s hibernating bats and is caused by the fungus Pseudogymnoascus (formerly Geomyces) destructans, has already burned its mark into history, and does not appear to be letting up any time soon. The destructans moniker is perhaps too fitting – has any other pathogen been as aptly named for its efficiency at destruction? White-nose syndrome (WNS) was first detected in upstate New York in the winter of 2006-2007 (Cryan et al. 2010). Though the initial stream of observations and research puzzled over its causes and consequences, it soon became apparent that North American bat biologists, conservationists, and land managers were dealing with an unprecedented plague on hibernating bats. It soon became abundantly clear that WNS was responsible for catastrophic population declines and was apparently spreading, unimpeded, throughout the eastern United States and Canada (Frick et al. 2010, Foley et al. 2011, Cryan et al. 2013). Researchers conclusively linked the disease, named for the white growths on the faces of infected bats, to the cryophilic (cold-loving) fungus Pseudogymnoascus destructans (PD), and identified it as a pathogen of European origin (Lorch et al. 2011, Warnecke et al. 2012). Little brown bat (Myotis lucifigus) infected with Pseudogymnoascus destructans, the fungus that causes white-nose syndrome. From there, speculation began to swirl as researchers and managers alike scrambled for any information to stem the tide. Here’s what we do know, now. PD arrived from Europe, where it also infects hibernating bats without causing the disastrous population declines we see with WNS (Wibbelt et al. 2011). Spread among North American caves and roosts where hibernating bats spend the winter (hibernacula) is caused mostly by bat-to-bat contact (Langwig et al. 2012, Zukal et al. 2014). It is still unclear how readily humans can help spread fungal spores, which has spurred much costernation regarding cave management and tourism. We do know that PD was plausibly introduced to the susceptible North American bats via human travel (Warnecke et al. 2012, Perry 2013). PD causes irritation and damage by growing on the skin of infected bats, creating characteristic lesions and scars on bat wings (Cryan et al. 2010, Warnecke et al. 2013). Furthermore, PD causes bats to rouse from their hibernating states more often than usual, resulting in wasted fat storages and increased energy expenditures during the coldest periods of the year, when insect prey are either scarce or entirely unavailable (Fenton 2012). Ultimately, WNS is estimated to kill large percentages, with hibernacula population declines estimated from a “mere” 75% to a terrifying 99% (Frick et al. 2010, Dzal et al. 2011). Colony of Pseudogymnoascus destructans grown in the lab. What effect does this staggering body count have on North American ecosystems? Let’s be clear: this is not simply a problem for bat enthusiasts alone. 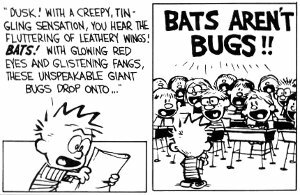 First, we can talk about everyone’s favorite nighttime pests (no, Calvin, we’re talking about bugs, not bats). Insectivorous bats are capable of consuming between 25-100%+ of their body weight in insects per night, fluctuating based on reproductive needs during the year (Kunz et al. 2011). Given average (pre-WNS) colony sizes in the millions for many species, multiple metric tons of insects are now bereft of their dominant predators in the ecosystem (Fenton 2012). Multiple agricultural pests, are specifically known to be controlled by bat predators, and the cost of WNS to the agricultural industry in increased pesticide use and crop damage is estimated in the billions of US dollars (Boyles et al. 2011, Kunz et al. 2011). Though only a small portion of most bat diets, large amounts of mosquitos can be consumed in aggregate by large bat colonies during the summer months (Fang 2010, Fenton 2012). For a disquieting thought experiment, imagine having even more mosquitos in our backyards and natural ecosystems. In truth, the situation is a lot of doom, and a lot of gloom. Yet it doesn’t help researchers, policymakers, or the bats to become mired in the stark reality of the epidemic, as tempting as it may be to wring our hands and despair. So what have we been doing? Perhaps one silver lining from this dire situation is the birth of a concerted cooperation within the federal government in responding to the spread of WNS. The US Fish and Wildlife Service, in particular, has been instrumental in regulating and standardizing protocols for cave closure, disinfection, and monitoring across the states (Voyles et al. 2014). These protocols aim to stem the tide of the disease, by shutting down caves from tourism, disinfecting clothes that may contain fungal spores, and closely monitoring population levels while minimizing bat contact (Perry 2013, Voyles et al. 2014). Cave monitoring of infected and deceased bats. Researchers have also not been fretting away the time of the bats. The years since WNS detection have been a whirlwind of scientific studies, monitoring and modeling the spread of the fungus across the USA and Canada. Currently, epidemiologists and population geneticists are working on establishing the contact network of the disease and its bat hosts, funneling that knowledge directly back to policymakers to inform targeted cave closures and decontamination (Foley et al. 2011, Langwig et al. 2012, Jachowski et al. 2014). We can breathe slightly easier to learn that not all bats are as cripplingly susceptible as the little brown bat, the unfortunate poster child of WNS. Promisingly, there are variable levels of resistance to either PD infection or the debilitating effects of WNS, and others can recover from infection (Cryan et al. 2013, Jachowski et al. 2014). Less promisingly, in the lab, we have become increasingly aware of the hardiness of PD, and its ability to persist for long periods in the soil of infected caves (Hoyt et al. 2014). Scientists are also plumbing our knowledge of antibiotic treatment in using fungicides to combat PD, though with mixed results (Foley et al. 2011). Ultimately, we must remember that WNS does not exist in a vacuum, but seems to be yet another emerging infectious disease with catastrophic implications for both natural environments and ecosystem services that humans depend upon. Consider the devastating amphibian plague caused by the fungus Batrachochytrium dendrobatidis (BD). For both PD and BD, the global interconnectedness of human populations is implicated in the ease of spread at continental scales (Taylor & Gurr 2014). That same interconnected community is also uniting field researchers, epidemiologists, and naturalists alike to synthesize data collection with theory and modeling. While we can sing an elegy for those bats that have perished to WNS, the future looks brighter as researchers and policymakers continue to collaborate and strive for containment and recovery. First posted on What She & Shi Said (under construction). Boyles, J. G., P. M. Cryan, G. F. McCracken, and T. H. Kunz. 2011. Economic importance of bats in agriculture. Science 332:41–42. Cryan, P. M., C. U. Meteyer, J. G. Boyles, and D. S. Blehert. 2010. Wing pathology of white-nose syndrome in bats suggests life-threatening disruption of physiology. BMC Biology 8:135. Cryan, P. M., C. U. Meteyer, J. G. Boyles, and D. S. Blehert. 2013. White-nose syndrome in bats: illuminating the darkness. BMC Biology 11:47. Dzal, Y., L. P. McGuire, N. Veselka, and M. B. Fenton. 2011. Going, going, gone: the impact of white-nose syndrome on the summer activity of the little brown bat (Myotis lucifugus). Biology Letters 7:392–394. Fenton, M. B. 2012. Bats and white-nose syndrome. Proceedings of the National Academy of Sciences of the USA 109:6794–6795. Foley, J., D. Clifford, K. Castle, P. Cryan, and R. S. Ostfeld. 2011. Investigating and managing the rapid emergence of white-nose syndrome, a novel, fatal, infectious disease of hibernating bats. Conservation Biology 25:223–231. Frick, W. F., J. F. Pollock, A. C. Hicks, K. E. Langwig, D. S. Reynolds, G. G. Turner, C. M. Butchkoski, et al. 2010. An emerging disease causes regional population collapse of a common North American bat species. Science 329:679–682. Jachowski, D. S., C. A. Dobony, L. S. Coleman, W. M. Ford, E. R. Britzke, and J. L. Rodrigue. 2014. Disease and community structure: white-nose syndrome alters spatial and temporal niche partitioning in sympatric bat species. Diversity and Distributions 20:1002–1015. Kunz, T. H., E. B. de Torrez, D. Bauer, T. Lobova, and T. H. Fleming. 2011. Ecosystem services provided by bats. Annals of the New York Academy of Sciences 1223:1–38. Langwig, K. E., W. F. Frick, J. T. Bried, A. C. Hicks, T. H. Kunz, and A. M. Kilpatrick. 2012. Sociality, density-dependence and microclimates determine the persistence of populations suffering from a novel fungal disease, white-nose syndrome. Ecology Letters 15:1050–1057. Lorch, J. M., C. U. Meteyer, M. J. Behr, J. G. Boyles, P. M. Cryan, A. C. Hicks, A. E. Ballmann, et al. 2011. 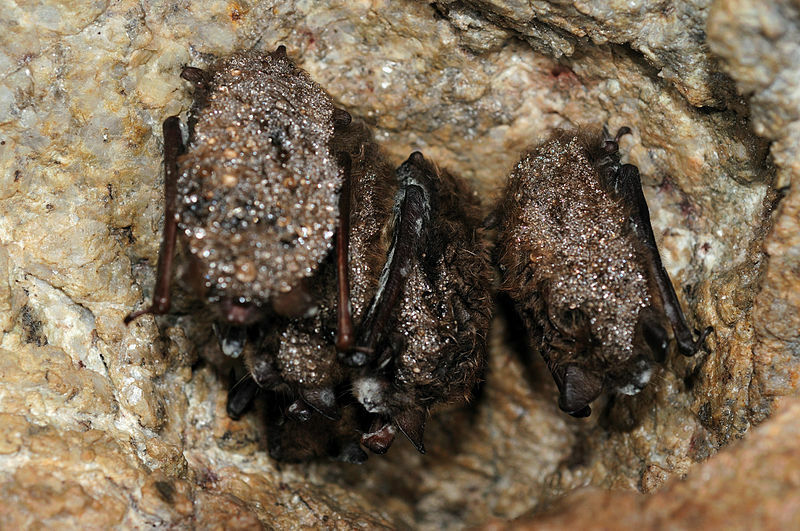 Experimental infection of bats with Geomyces destructans causes white-nose syndrome. Nature 480:376–378. Perry, R. W. 2013. White-nose syndrome in bats: an overview of current knowledge for land managers. General Technical Report (USDA). Taylor, C., and S. Gurr. 2014. Fungal pathogenesis: Past, present and future. Fungal Biology Reviews 28:24–28. Warnecke, L., J. M. Turner, T. K. Bollinger, J. M. Lorch, V. Misra, P. M. Cryan, G. Wibbelt, et al. 2012. Inoculation of bats with European Geomyces destructans supports the novel pathogen hypothesis for the origin of white-nose syndrome. Proceedings of the National Academy of Sciences of the USA 109:6999–7003. Warnecke, L., J. M. Turner, T. K. Bollinger, V. Misra, P. M. Cryan, D. S. Blehert, G. Wibbelt, et al. 2013. Pathophysiology of white-nose syndrome in bats: a mechanistic model linking wing damage to mortality. Biology Letters 9:20130177. Wibbelt, G., A. Kurth, D. Hellmann, M. Weishaar, A. Barlow, M. Veith, J. Prüger, et al. 2010. White-nose syndrome fungus (Geomyces destructans) in bats, Europe. Emerging Infectious Diseases 16:1237–1243. Zukal, J., H. Bandouchova, T. Bartonicka, H. Berkova, V. Brack, J. Brichta, M. Dolinay, et al. 2014. White-nose syndrome fungus: a generalist pathogen of hibernating bats. PloS One 9:e97224.